I have a few things to talk to you about. 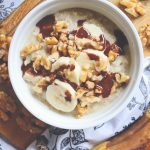 Aside from this indulgent Chunky Monkey oatmeal recipe (which is simple, quick, cheap, and NOT boring – perfect for a filling breakfast before school on the colder days), of course. It’s autumn! But you probably already know. How did summer pass by so fast? I don’t know, but I think you can expect extra warming recipes from me for a good 6 months. Soup season incoming! The only thing I’m not looking forward to is relying on frozen fruits. The melons were good while they lasted. I’ve experienced issues with my pictures’ quality on WordPress since I started blogging – but not anymore! I only had to click a button to solve my problem. Are you kidding me…? But it’s better to learn that a year later than never, right? New food photography props! I hope you’re already enjoying the sight of my wooden cutting board (which I don’t use for cutting) and one of my newest kitchen towels in my pictures. 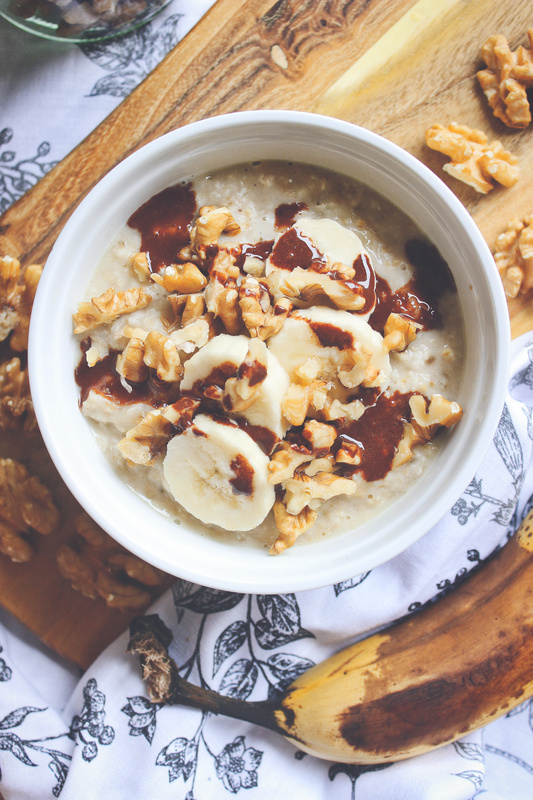 But let’s talk about this Chunky Monkey oatmeal recipe now. 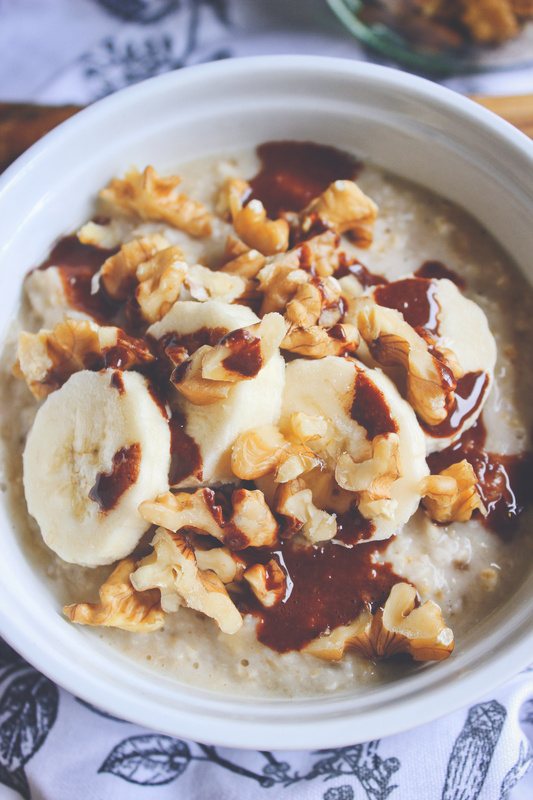 I love coming up with different flavours for oatmeal. Banana bread, carrot cake, and caramelised apple is among my favourites – I might share one of those another time. I find oatmeal very filling and satisfying. It never fails to warm me up during the cold months. But, really, I can happily eat it any time of the year. 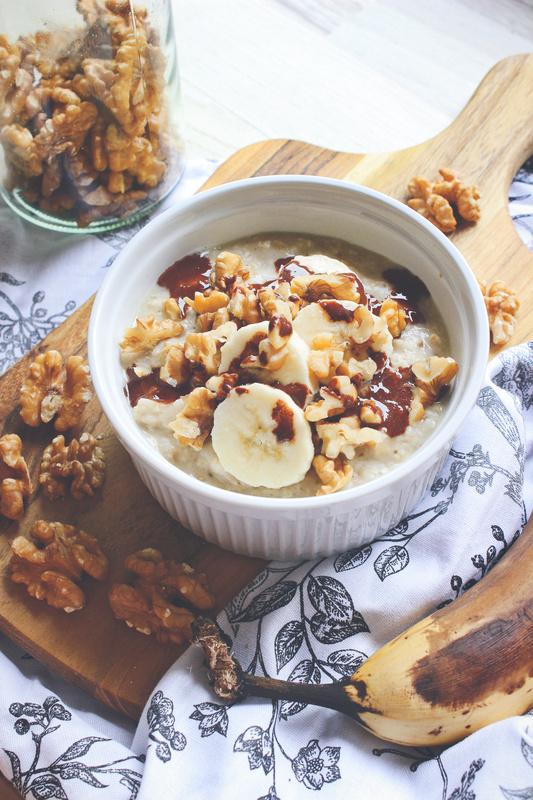 What’s better than a bowl of creamy banana-flavoured oatmeal topped with more banana, earthy walnuts, and a simple (and healthy?!) chocolate sauce? Nothing, my friends, nothing. 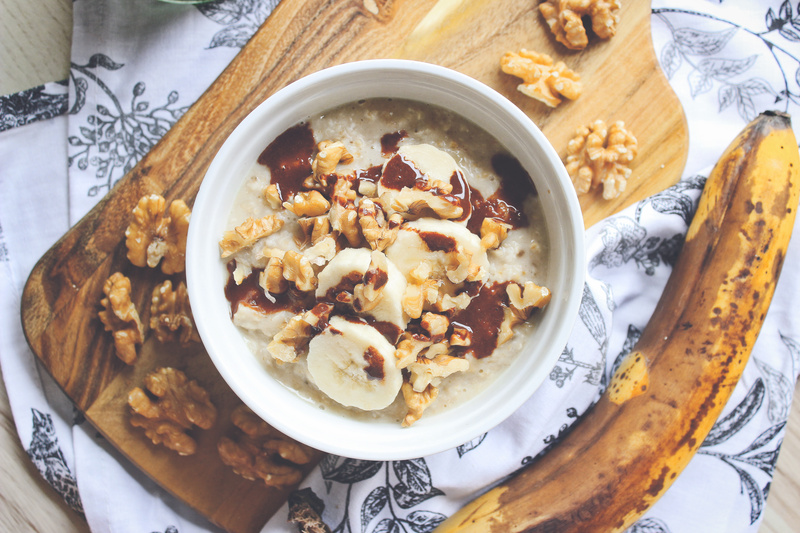 The best thing is it’s an affordable breakfast that comes together in 10 minutes with ingredients you probably already have in your cupboard. 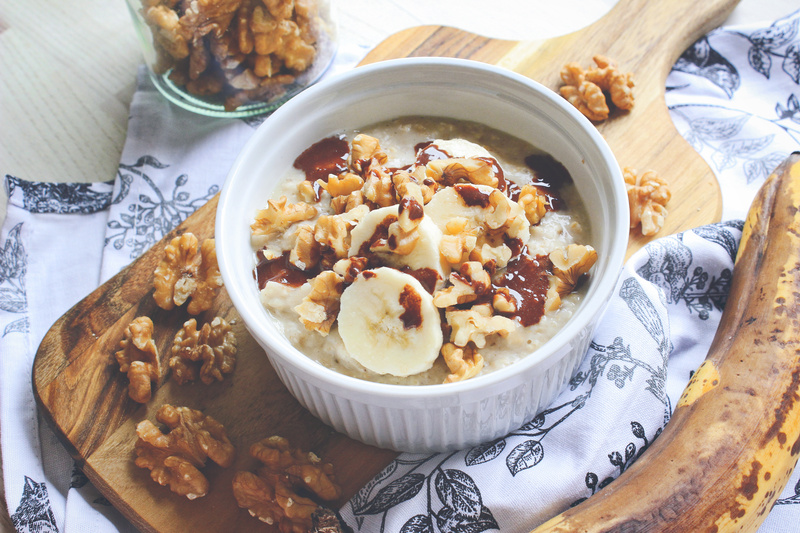 This morning I decided make a bowl of oatmeal inspired by the classic ice cream flavour, Chunky Monkey. It turned out amazing. I love Ben & Jerry’s vegan Chunky Monkey ice cream, but it’s sad my local grocery stores only carry two of their vegan flavours. While I was in Orlando, I got the opportunity to try the Coconut Seven Layer Bar and Caramel Almond Brittle flavour, and they were very nice. I wish I had few scoops of them right now! If you try my recipe, or you just have something to say or ask me, leave a comment below! And if you do try my recipe, don’t forget to tag me on Instagram and use the hashtag #spirendeveganer. My profile name is @spirendeveganer. I’d love to read your opinions and see your recreations! Add the oats, water, vanilla powder, and sea salt to a small pot and bring it to a boil. While the water is heating up, mash one half of the banana with a fork in a small bowl. Once the water starts boiling, reduce the heat to medium, add the mashed banana to the pot, and stir it into the mixture. Let the oatmeal simmer for 2-5 minutes, or until it has thickened to your liking, stirring it frequently. In the meantime, slice the other half of the banana to use for topping and roughly chop the walnuts. Add the chocolate sauce ingredients to a small bowl and stir them together with a teaspoon until smooth. If you're here for the chocolate, feel free to double (or triple) the chocolate sauce ingredients! 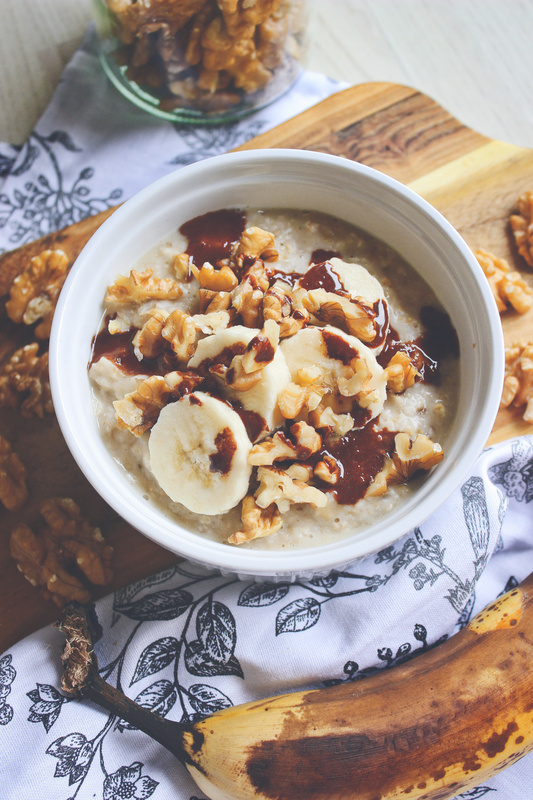 And, again, for all the chocolate-lovers out there, you can use vegan chocolate chips as an additional topping for an extra chocolate-indulgent oatmeal.